I like to think of the tractor as the Cuisinart of land. There are so many little chores on the homestead that a tractor can perform that without one, life is just a little harder and a little less pleasant. Even if making a living keeps you indoors most of the day, with a tractor you still have time to have a mowed lawn, a smooth driveway, clipped fields, and plowed gardens, among many other things. 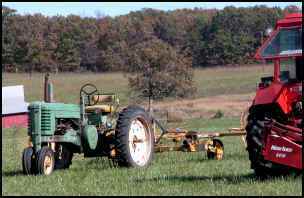 Of course, owning a tractor can be a pretty cash-intensive endeavor as even lawn tractors can cost several thousand dollars. That’s if you buy them new. So who needs new anyway? Tractors are marvelously sturdy beasts, built to work hard for years on end. They’re also pretty simple, at least the old ones are. Pictured above is my 1952 Ford 8N tractor. I bought it about three years ago to bush-hog our fields and keep our long driveway maintained. I picked the 8N for several practical reasons such as it’s small and economical size and because even 51 years after the end of production, parts are cheap and plentiful. I also had some sentimental reasons for picking the 8N because my ’52 model reminded me so much of the ’49 my mother bought from a neighbor when we set out to live on an abandoned farm here in rural Pennsylvania. I understand that by the end of production, the 8N was selling new for about $1,400. Twenty years ago, mom got hers for $2,500 and in 2000 I paid $3,000 for mine. So if you want to look at it that way, my Ford must be a pretty good investment. With a budget of no more than $2,500-$7,500 you can find a machine between 60 and 30 years old that, with a little maintenance and maybe a new part every so often, will perform the heavy work for your family years, indeed decades into the future. You might wonder, perhaps judging from your first car, if you can expect to reap real work from what can officially be called an antique. I have to admit that my beloved ’52 Ford needs every one of it’s 23 horsepower just to mow the tall grass in the meadow in early autumn, but it does the job the way I want it done, and while none of these old classics can really compete with some of the enormous monsters being built today, you can certainly get all the power you’ll need on a homestead farm. In fact, you’ll find that large and powerful classic tractors may not cost you any more than another agile, but less powerful, classic tractors. Power is nice, but it does take a bit more fuel, which is a minor consideration, and it’s harder to move, which can be a very major one. Safe, easy transport is a matter that needs to be taken into consideration. Driving a tractor on the highway is, at best, a very nerve-wracking undertaking, so if you need to take yours to the shop, or for a job on a distant farm, you’ll want to be able to haul it. We haul my Ford on a small utility trailer pulled behind our quarter-ton pickup. It only weighs about 2,400 lbs, full of gas, after all. Our neighbor, on the other hand, has a 65-horsepower 1956 John Deere 80 diesel that weighs over 10,000 lbs and needs a much heavier truck and trailer to move it safely. That brings up my final point: safety first. I’ve spent some of my most relaxed times mowing our large rear lawn with my Ford. Combine the blue sky, the smell of the grass, and one of those gorgeous summer days that we have here in the Poconos; it can all be intoxicating. That’s why I have to always remind myself that farming is one of the most dangerous professions and that this thing can kill me even if I’m only going 3/10ths of a mile per hour. If you don’t have one, get yourself one of these classic tractors. You’ll love what it does for your land, your roads, and your disposition. But, remember to be careful, too. A 1948 John Deere “B” working alongside a behemoth modern tractor.